I get...." Are you Crazy?!" I am a 49 year old woman whose kids are grown and who could not get my husband to come in and sit and learn to crochet with me so.....instead of me sitting, watching old movies and praying for his safe return.....I said, "Buy me a new bike and I will learn to ride with you!" ( He has 2, 1978 KZ1000's) Well, a few days later I had a new 2007 Honda Shadow Sabre 1100cc, Candy Black Cherry, and was on my way! That was 3 weeks ago today. I have put 608 miles on it and have not looked back. I love it! Each time I ride I relax and enjoy it abit more. Last Sunday we went on our "First Annual Father's Day Run" what a way to celebrate the man I have loved these 30 years. I am taking a safety course the end of July and upon successful completion of the course will have my MC endorsement. I am already bugging him to ride to Denver to see our oldest daughter.... the kids think it is kind of crazy/cool but say to go for it. They know I did not approve of a lot of the things they were doing! A lot of folks say I am crazy.... I say they are dull and boring.... I even got my hair cut short last week to help with the dreaded helmet hair! It is short, sharp and ready to ride. The only way to catch me at home now is if it is raining or dark outside! I told Rich, "Be careful what you wish for!" He says he has created a monster. I Googled "How to ride a motorcycle " and the first link I clicked on said, "Just do it!" So that is my advice to you ladies who are thinking of riding....Just Do It! I did! Thanks for a great womens' cyclist site. Comments for I get...." Are you Crazy?!" why hold back because of what might happen? People die waiting in bus shelters for the city bus to come along because some drunk loses control, or the idiot speeding down the street and jumping the curb, or die of some illness. We don't live in a bubble and who wants to? That's not living. We only go around once, don't let fear of what if? hold you back. If you're a good driver now, you'll be a good driver on your bike. Enjoy the ride! 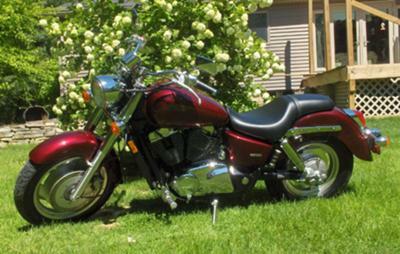 I am still loving to ride...had that bike painted last spring pearl pink and grey with burgundy pinstripe...sharp! You'd be crazy NO to!! Why do people think women (or men for that matter) who want to ride are crazy? If it is something you wanna do, then you are crazy NOT to! I have had so many people say "I'd be too chicken to get on one of those" or "I wish I had the guts to do it"....well, DO IT. I know people who have honestly tried learning to ride, and it was not for them. BUT 99% of the people I know who learned said "I should have done this years ago"!! What's up with that!? I also get "When are you getting a tattoo?" Well, I have had 2 tatts for 15-16 years and 1 for @ 5.... However....I will get a new one to symbolize the excitement/freedom I am achieving in my life at this time. Also, I have found all this bike stuff has added a spark to our life in other areas....almost everyday is "Honda Appreciation Day"....if you know what I mean ladies! I also went out and took the course. Which I recommend highly. I said to my Boyfriend that before I turned 50 that I would have a MC license, MC, and a tattoo. Well, 5 yrs ago I got my license and 4 yrs ago I got my tattoo and 2yrs ago I bought MYSELF a 1200L Harley Sportster. I turn 51 today and have about 10,000 miles on my bike now. You are never to old to learn new tricks and this way I meet a whole lot of nice people. Congratulations on your bike. It is beautiful. My son-in-law just bought a 750 Honda Spirit Candy Apple Red with flames on the tank. He loves it. I would put my picture of my bike in here but have now clue on how to do it. Keep The Ride Alive!!!!!! Yepper, I too am Crazy!!!!! I too am crazy!! Last year I saw a ton of women riders and said to my then husband that we should learn to ride, he said "Are you goofy, this menopause thing must have made you crazy and sent you off the deep end" I'm only 46 and have been taking care of his 2 boys, running interference with his ex-wife, building a new house, taking care of the old one, bills, medical/dental for the kids, football, baseball, school activities, he worked out of town all week. Needless to say he doesn't have to worry about "The menopause thing or me going off the deep end" anymore. I do miss the kids but could only take so much demeaning attitude. I just bought a Vulcan 500, IN MY NAME, NOT HIS. I had a Honda Rebel 250, boy what a difference, I would have liked a 900 but wasn't confident enough to try a bigger bike, maybe in a couple years. Its so wonderful out riding, everyone says you could get hit or a deer could run out in front of you, or this or that. Well these things are a good possibility but they can also happen in a car. I bought a Pink and White leather jacket so everyone can see me better, I get jeers from my friends that its kinda hokey, but I want to be seen and not a become a casualty. This website is SO COOL!!!!!!!! !